The Sovershenny is the most advanced corvette in Russia's Pacific Fleet, which may get two warships of the same class in the immediate future, Russian military expert Viktor Baranets told Sputnik. Earlier this week, Vladimir Matveev, head of the of the Russian Eastern Military District's press service for the country's Pacific Fleet said that the Sovershenny (Consummate) – the newest class of corvette in the Russian Navy – had successfully completed sea trials and would soon enter service with the Pacific Fleet. 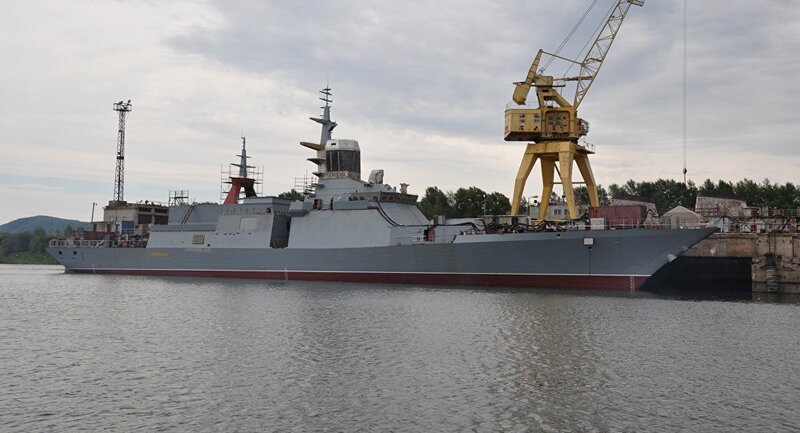 Laid down at the Amur Shipyard in 2006 and launched in 2015, the Sovershenny will be the fifth Steregushchy (Vigilant) class, Project 20380 corvette to be commissioned into the Russian Navy, and the first to join the Pacific Fleet. — Ian Keddie (@IanJKeddie) 22 марта 2017 г. The Steregushchy-class is Russia's newest corvette design, and with a displacement of 2,200 metric tons, is designated by NATO as a frigate. The Sovershenny, a 104.5-meter long, diesel-powered vessel with a crew of 90-100 officers and able sailors, is classified by the Navy as a multi-purpose vessel armed with the latest guided missile systems and designed for coastal defense. — Defence blog (@Defence_blog) 30 января 2017 г. In an interview with Sputnik, Russian military expert Viktor Baranets specifically focused on the characteristics and combat capabilities of the Sovershenny corvette. "While in service with the Pacific Fleet, this corvette will deal with many tasks related to patrolling, fighting enemy surface ships and submarines, as well as the destruction of enemy cruise missiles," Baranets said. He recalled that with a range of 4,000 nautical miles and a top speed of 27 knots, the Sovershennyy is capable of remaining at sea for 15 days before requiring refueling and/or replenishment. He also touted the corvette's armament, which he said is "very decent for a ship of this class." "These include a 100mm [forward] cannon, two six-barrel anti-aircraft guns with a firing rate of 6,000 rounds per minute and Uran launchers with anti-ship missiles designed to destroy large surface targets. Additionally, this corvette has eight torpedoes, a [Ka-27 multirole] helicopter, and, of course, the most modern radar and radio electronic equipment. Congratulations to the Pacific Fleet on such a serious acquisition," Baranets said. He did not rule out that more such corvettes may be put on service by the Russian Pacific Fleet in the near future. "I think that the Gromkiy (Loud) and the Rezviy (Quick), two brand-new corvettes of the same class, will enter service wtih the Pacific Fleet in the next few years," he said. The Sovershenny corvette uses stealth technology and its radar signature is reduced thanks to the cutting-edge architecture of its hull and the use of radar-absorbing fiberglass. The modular design allows for the space-efficient integration of weapons systems and/or their replacement with alternative weapon systems. As for the subsonic Kh-35 anti-ship missiles, they boast a high degree of immunity to enemy countermeasures and are equipped with inertial guidance and active radar homing systems.